← Baby light my fire. This is pretty much how I feel about 2011. I mean, it was an unbelievable year. My first two plays premiered to sold-out audiences. I finished a third play, my first commission. I finished my first novel. I completed two successful residencies. I left a horrible day job and started my own business. I moved into a huge new apartment with a writing studio. I went to D.C. to meet playwrights. I went to New York to meet more playwrights. I helped take care of my Dad during a terrible health scare. I broke my sugar habit. I learned how to cook masoor dal. I saved enough money to go abroad again, this time to Belize and Costa Rica. I fly out next week. But tonight I am oh so very tired. And extremely cute!! I can’t help but look at that face and see an angel! Love to you. Get recharged because 2012 will be busy too!! Rest, renewal, and a Happy New Year to you. I’ll bet you’ll get all caught up on rest and relaxation in Costa Rica. One day on a sunny beach is worth 30 regular ones, I think! P.S. 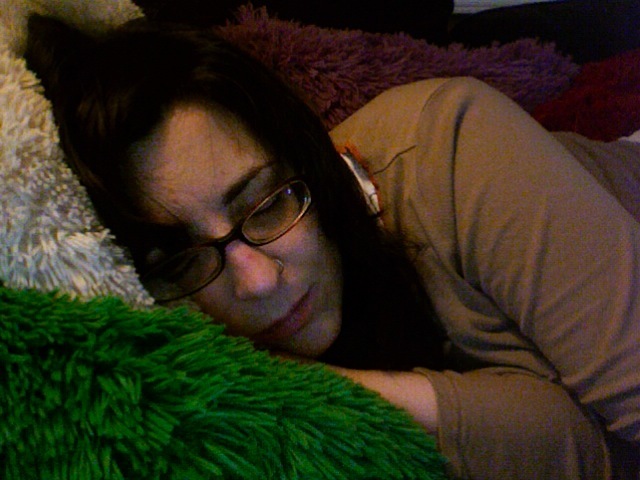 Does that photo show you sleeping on a mound of fuzzy bathmats? And Crystal: they’re a special kind of pillow called Polar Bear from Bed, Bath & Beyond–I love them so. I bought seven of them.